Provide expert care for cats and dogs! 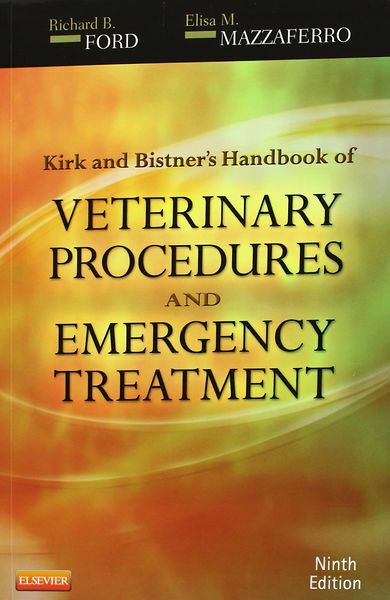 Kirk and Bistner's "Handbook of Veterinary Procedures and Emergency Treatment, 9th Edition" covers not only the management of emergency conditions, but also strategies for dealing with hundreds of routine diagnostic and treatment challenges in small animals. Its user-friendly format provides instant access to vital information - making it an ideal resource in emergency situations - and it is conveniently organized by both body systems and presenting signs to help you easily reach a diagnosis and determine a treatment plan for all clinical situations. 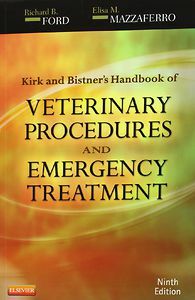 Written by veterinary experts Richard Ford and Elisa Mazzaferro, Kirk and Bistner's "Handbook of Veterinary Procedures and Emergency Treatment" provides current guidelines for small animal emergency care and the diagnostic procedures most commonly performed in a busy, team-oriented practice.